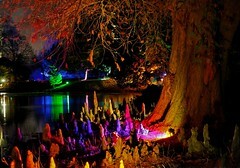 At Syon park, where they string copious amounts of lights to trees, bushes, and probably anything else that doesn’t move, to create effects like this. Not that it was a warm, pleasant summer’s eve, oh no, you don’t expect that in November…but at least it didn’t rain! All in all a rather interesting evening. Although the Syon people might want to give some thought as to telling people where the shabby-looking alley that masquarades as an entrance is, unless you’ve been there before it’s not exactly obvious, as poor Lisa found out. But she made it in the end, so all was well! 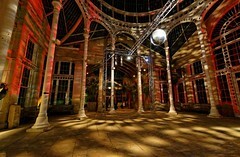 And who can resist the Syon conservatory, which looks pretty good under normal circumstances, going disco? 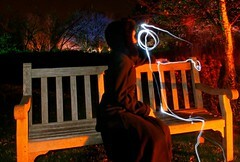 This entry was posted in cold, colour, disco, flickrmeet, lightpainting, lights, Syon. Bookmark the permalink. Gah. More and more, I am cursing my employer’s blocking of flickr. I don’t catch up with my groups nearly as much, since i can’t read them at luch time, so I miss things.